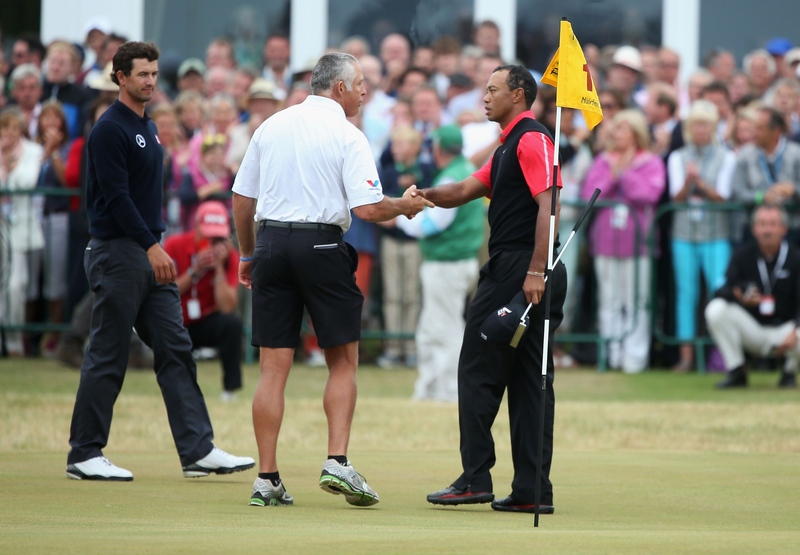 Tiger Woods and Steve Williams shook hands on the 18th at the conclusion of the Open Championship at Muirfield on Sunday. Does this mean they have buried the hatchet? Does Tiger want him back? Will Adam Scott be in the market for a new bag man? I think so. 5 years. No Major. He has 14. He needs 19. Tiger is 5 away. He wants it bad. He can do it. You know it. I know it. Stevie can help. So can Butch. In fact, call Butch. I have his number. Let me find it. I’ll TM you. Don’t be so hard headed, Tiger. Solve the problems. Get on with it. Phil Mickelson is the new Tiger Woods right now. That’s good for golf. That’s not good for you. Tiger. btw….I am a huge LEFTY fan….happy for you! This entry was posted in Celebrities, dp@large, Hiring and Firing, PGA Tour, Positive Thinking, Tiger Woods and tagged Adam Scott, Men's major golf championships, Muirfield, Open Championship, Phil Mickelson, Steve Williams, Tiger, Tiger Woods by dp@large. Bookmark the permalink.